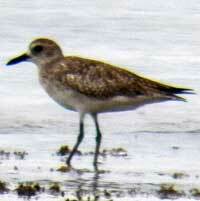 Conspicuous and common shorebird of open areas where there may be seasonal pools. Black and white crown with red bill. 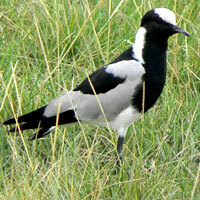 Sharply plumaged black, gray and white bird frequent on wet ground and near water bodies. Cap black. 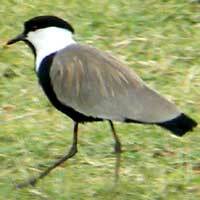 Similar to Spur-winged Plover. Bold white, black and gray, but notice this one has a white cap. Frequents shorelines and also short grass open areas. 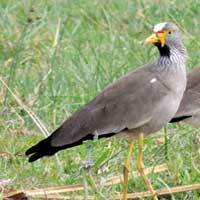 Distinctive shore bird with long yellow legs and fleshy wattles on the face. 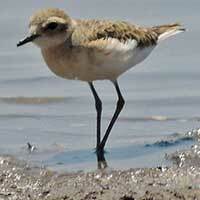 Small shore bird with peach or pinkish breast in breeding plumage. Sometimes forages away from water in short grass. 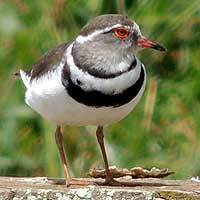 The red orbital eye-ring and the two black bands across the upper chest distinguish this bird of pond and lake edges. 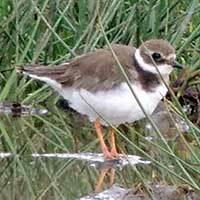 Small migrant from northern winter with one black neck ring and orange legs. 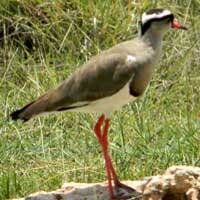 Shore bird in winter plumage on Indian Ocean coasts. Gray and white. Rather short, sturdy bill. By no means am I an expert on the Natural History of Kenya. I am new to exploring this part of the World. By creating a page for the species as I learn about them I am teaching myself. If I make errors I expect that a kind person will let me know so that I can make corrections.